CALGARY — Canadian women’s goalkeeper Stephanie Labbe has been denied a chance to play for the Calgary Foothills FC men’s soccer team by the league citing her gender. The 31-year-old from Stony Plain, Alta., was trying out for Foothills FC. The Premier Development League, a feeder league sponsored by United Soccer Leagues in the United States and Canada, says no. "I have given it my best fight and feel myself fitting in, but unfortunately not everyone is as open minded about this situation," Labbe wrote in her blog. Labbe has earned 49 caps for Canada and helped the women’s team win an Olympic bronze in Rio in 2016. She’s been looking for a place to play since parting ways with the National Women’s Soccer League’s Washington Spirit earlier this year. The PDL told The Canadian Press in a statement that, "like virtually all of our peer leagues around the world, the PDL has gender-based eligibility requirements, which we applied consistently in this case. "Although our specific mission relates to the men’s game, we applaud all that female players have done to move the sport of soccer forward in North America. "Stephanie Labbe, in particular, has had tremendous success, and we wish her the best as she continues to pursue her career goals." Labbe has played in pre-season matches for Foothills, who open the regular season May 11 versus the Victoria Highlanders. 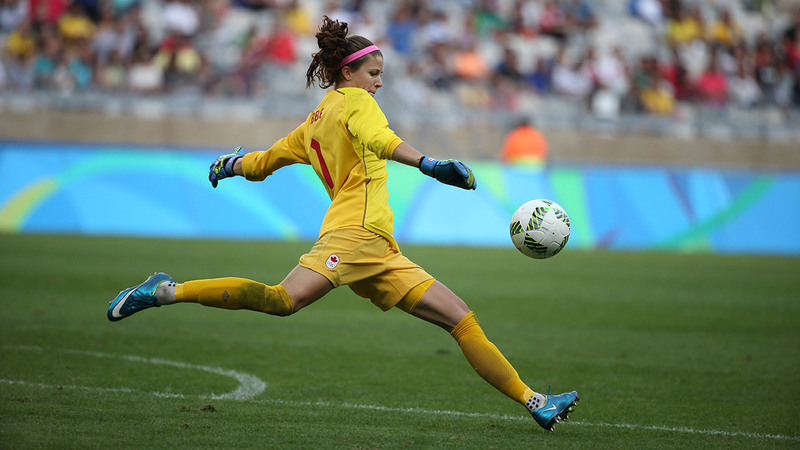 Labbe did not respond to an email message from The Canadian Press, but Foothills FC coach Tommy Wheeldon Jr., said she has the talent to be among his three goalkeepers. "She fits our style of play," Wheeldon said. "I like my goalkeepers to act like sweepers that can play out with their feet. "She’s done well. She came on against FC Edmonton’s Academy team and made two really great saves." Labbe wrote she’s not giving up on playing with the men’s team. "This may be the first road block, but hearing ‘no’ doesn’t mean the end, it just means we have to find a diversion around the problem," she said. Wheeldon Jr. says there isn’t enough time to appeal to the league with a short season from May to early August. He adds any rule changes likely couldn’t happen until the PDL’s annual general meeting in December. But Labbe can train with his team in the meantime, he says. "The season is too short to fight it for this season," Wheeldon Jr. said. "What we’ve said is we support her being part of the group right now. "We have a UWS women’s team which is an option for her to play games with and continue to train with the men in preparation for her next national team camp."